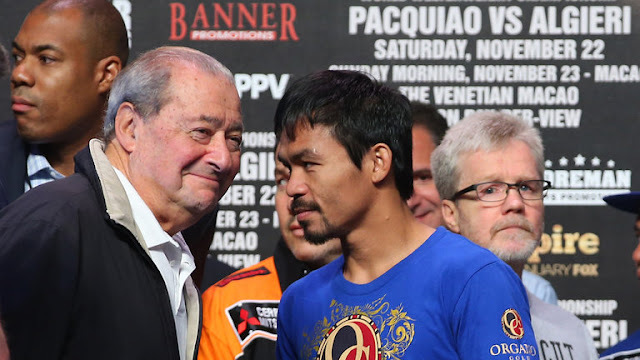 Home Boxing Arum: "We plan to have Manny fight four times this year"
Arum: "We plan to have Manny fight four times this year"
Top Rank promoter Bob Arum said that Pacquiao will fight four times this year 2017 as part of his farewell tour in boxing. Bob Arum said: “We plan to have Manny fight four times this year – we have an offer in Russia in July, another offer in Europe for September and in the U.S. against [unbeaten two-belt junior-welterweight champion] Terence Crawford in November or December,”. Pacquiao who recently signed to fight Jeff Horn on April 22, 2017, at the yet undecided venue. That would be his 1st fight this year. No name yet for other opponents except Terence Crawford that Arum said Pacquiao will fight in November or December this year. The 8th division world champion Manny Pacquiao will turn 39 years old in December.